Historic Downtown Summerville is a celebration of heritage and natural beauty. The community still gathers at Town Square for the 4th of July. Friday night high school football draws a spirited, overflowing crowd. And in early December, the holiday season is ushered in when town folks meet at Town Square for the Annual Christmas Tree Lighting when thousands of white lights are turned on to brighten the historic downtown district. 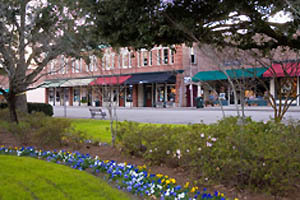 It's all right here in Historic Downtown Summerville... great restaurants, elegant shops, outdoor recreation, and historic sites... the amenities are endless! In Historic Downtown Summerville, you will find a warm and welcoming community filled with a sense of undying respect for its past and a relentless commitment to its future. We hope you enjoy your stay and will return again. See homes in the historic district of Summerville decked with Christmas decorations. The Flowertown Garden Club of Summerville is sponsoring the Summerville Candlelight Christmas Tour of Homes, 2008. Bohicket Boat Adventure & Tour Co.